Define your life. Ride a bike...at The Recon Tour! Define your life. 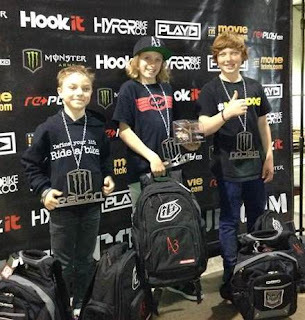 Ride a (BMX) bike...at The Recon Tour in Columbus last weekend. 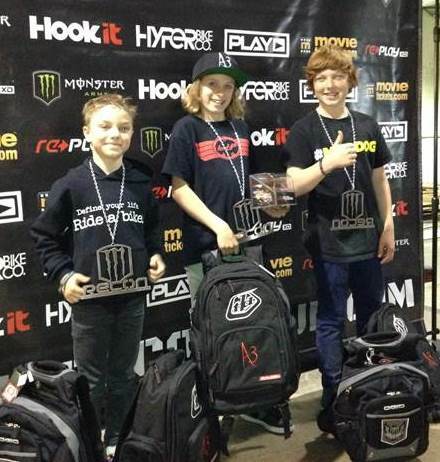 Congratulations to Medina's Graydon Schneider for placing 3rd in the 8-12 year old class! On a side note, now THOSE are what medals should be -- bigger than your face and fiercely cool so nobody questions your winning ways. The spring weather held out long enough this past Saturday for our biggest-ever first of the season Night Ride. 231 people showed up! Thanks for everyone for helping us to kick off our 19th season of Night Rides on the Towpath Trail! 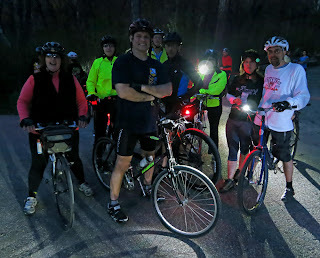 Our next Night Ride on the Towpath Trail is on Saturday, May 18, 2013. It's our ride for National Bike Month and Cleveland Bike Month, as well as an official event of Friends of the Crooked River's RiverDay festival! Oh, and if you come to the next Night Ride, you'll have the opportunity to check off as many as 17 squares on the Bike Month Bingo game! 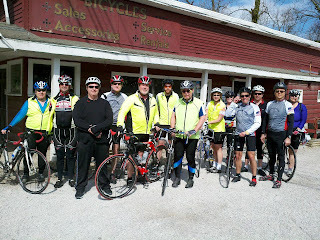 Next Sunday, May 5, join us for the next of our monthly Group Road Bike Rides! We'll be starting at 10:00am from the Peninsula store. All skill levels are welcome! PLEASE NOTE: We've been informed that road construction crews are working on re-surfacing Riverview Road, starting from Bolanz Road, north to where the railroad tracks cross. Traffic will be maintained with flaggers, but we'll play it by ear, and if it looks too rough, we'll detour over on Bolanz Road and head back north on Akron-Peninsula Road. 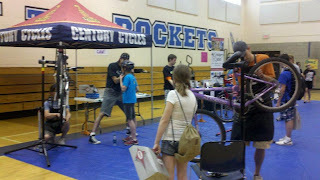 the Century Cycles staff, Akron Bike Club, and Nordonia Hills Velo Club. With Spring finally on its way, that means mountain biking season returns to Northeast Ohio. Many of our local mountain bike trails are still closed to give them time to dry out (such as the Cleveland Metroparks Royalview Trail and West Branch State Park). However, there are a couple of trails that are open and ride-able now, such as Quail Hollow State Park and Mohican State Park. Looking for a new rig to tackle the roughest mountain bike trails? Or even just wanting to upgrade your Towpath Trail cruiser to something more plush? Look no further than the 2012 Giant Anthem X 3. This strong and light racer features RockShox suspension front and rear, plus a SRAM 30-speed drive train, tapered and oversized head tube for front-end stiffness and control, and Giant custom ALUXX aluminum frame. In stock in our Medina store in Small, Medium, and Large frame sizes. Originally $2,249.99, now on SALE for $1,799.99. 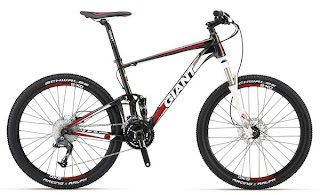 You can check out more great deals on bikes on our Previous Model Year Bike Clearance page. In 2012, Jamie Kerka and Gideon Lorette won Raleigh Bicycles' Bike To School Challenge Scholarships, presented by Chris Speyer from Raleigh Bicycles (far left) and Jason Martin, Principal of Bay High School (far right). Bay Bike to School Challenge announces that one of its sponsors, bicycle manufacturer Raleigh Bicycles, will be awarding a $1,000 scholarship to a Bay Bike to School Challenge participant in the senior class at Bay High School. · Complete an application and submit it to the Bay High School Guidance Office by Monday, May 6, 2012. · Bicycle from home to Bay High School at least 10 days during the 2013 Bay Bike To School Challenge between May 6 and May 24. Applicants must submit their completed Bike To School ride cards to the Guidance Office, where a copy will be made of each one and attached to their application. The original ride card can then be redeemed for the BTS Challenge t-shirt and/or put into the grand prize drawing. · Once the applicant has biked 10 times (or completed two ride cards), the application will be activated for consideration. · There is no GPA requirement. 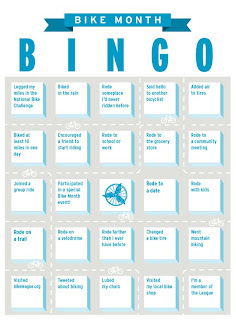 · Representatives from Raleigh Bicycles and Bay Bike To School Challenge will select the winner based on the following criteria: Application essays showing a passion for bicycling and a commitment to a healthy life and/or environment, as well as participation in Bay Bike To School Challenge. The scholarship will be awarded on Friday, May 24, at the school-wide assembly at Bay High School that concludes Bay Bike to School Challenge. For more scholarship details and to download an application, go to www.centurycycles.com/for/BTS or www.bayvillageschools.com. In addition to offering these scholarships as part of its sponsorship of Bay Bike To School Challenge, Raleigh Bicycles is providing the program’s grand prizes (two Raleigh bicycles each for Bay Middle School and Bay High School), which students can enter to win after every four bicycle rides to school between May 6 and May 24. Raleigh Bicycles will also give each school $500 if its students exceed the bike-riding milestones set by last year’s challenge, and it plans to award the City of Bay Village with a $1,000 grant to improve bicycling infrastructure in the city. “By including a scholarship in their generous sponsorship of Bay Bike To School Challenge, Raleigh Bicycles demonstrates that it is not just a partner in the Bay Schools’ effort to make the planet a better place by encouraging students to find healthy and green methods of transportation, but that they also support the value and importance the Bay Schools place upon education,” said Jason Martin, principal of Bay High School. 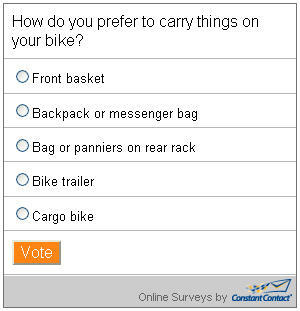 Poll: How do you prefer to carry things on your bike? How do you prefer to carry things by bike? Click here to take our latest online poll and let us know! Last month's poll asked, "How many bicycles does your household own?" The most responses (57%) were "3-6," and 3% of the people responding own over 20 bikes! You can see the full results of the last poll here. Century Cycles' Night Rides on the Towpath Trail have been popular events throughout the cycling season for going on 19 years, and have been featured in several news outlets, from local publications such as the Akron Beacon-Journal and Cleveland Plain Dealer, to national magazines such as Bicycling and Bicycle Retailer and Industy News. Our first ride of the 2013 season is THIS Saturday, April 27. The ride begins at 8:00pm from the Peninsula store. Never ridden on a Night Ride before? These 5 Tips will help you get started, or provide some reminders to prepare for a new season of Night Rides even if you're a weathered veteran! Helmets are mandatory on all Century Cycles Night Rides. Every rider must also have their own headlight. Any headlight will do; you don't need anything fancy. A camping-style headlamp is okay, as long as it can be adjusted to fit over or under your helmet. Even a flashlight duct-taped to your helmet or handlebar will work. A bicycle-specific headlight works best and is the most convenient, and these are available for around $30 and up. A tail light can be used, but is not required. See our full selection of bike lights here. The Ohio & Erie Canal Towpath Trail is unlit, and can be pitch dark after sundown. Although riding at night with the proper equipment is safe and fun, you may also want to check out our Night Ride on the Towpath Trail Safety Tips. You'll need time to find a place to park. Parking at the Century Cycles lot is very limited; use on-street parking or the Lock 29 Trailhead parking lot if necessary. Then, you'll need time to change into your riding clothes, unload your bike, and do a last-minute double-check of your bike tires, brakes, etc. If you need any accessories or mechanical help, the store is usually open until the ride starts, but please be reasonable--we won't have the time for major repairs, and we don't want to delay the start of the ride for the dozens of other participants. Most importantly, arriving early gives you plenty of time to introduce yourself, socialize with the other riders, and HAVE FUN. That's what it's all about! See www.centurycycles.com/for/NightRides for the complete ride schedule, as well as more articles, photos, and videos from past rides! 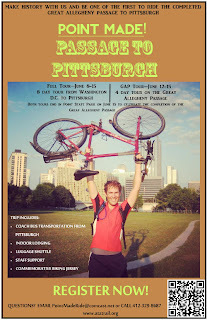 Nat'l Bike Challenge Begins May 1: Bike More and Beat Pittsburgh! Make every mile on your bike count between May 1 and August 31 -- AND help Cleveland BEAT Pittsburgh! Take the National Bike Challenge (www.nationalbikechallenge.org) to boost your miles and time on your bike (plus track calories burned and CO2 saved via Endomondo), share your love of bicycling, and help CLE sign up more bicyclists than PGH! 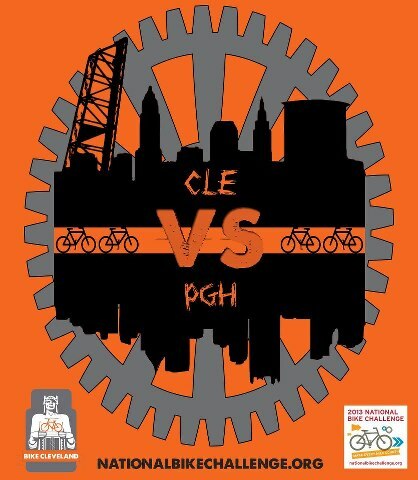 Last year 30,000 cyclists took the challenge nationwide, and Pittsburgh beat Cleveland for sign-ups. This year, they hope 50,000 people will take the challenge (and of course we hope -- nay, PLAN! -- to beat to Pittsburgh)! C'mon -- LET'S RIDE and BEAT PGH! Century Cycles' store in Rocky River is located less than a mile from the Cleveland Metroparks. The staff there (as well as every Northeast Ohio cyclist) knows that the "Emerald Necklace" formed by the Metroparks contains some of the area's best riding. This 36-mile ride starts at Huntington Reservation in the city of Bay Village. You'll enjoy views of Lake Erie at the beginning and end of the ride. You'll begin on relatively bike-friendly roads before making your way over to the Rocky River Reservation, one of the "jewels" of the Metroparks Emerald Necklace. Our route follows the Valley Parkway road through the park, but you can choose to ride on the All-Purpose Trail instead to avoid car traffic. At the northern end of the Rocky River Reservation, you'll turn left onto Detroit Road, and pass by our Rocky River store in less than a mile, in case you're in need of any bike supplies. Turn right on Wagar Road, then after a short stretch you're back on Lake Road, on the shore of Lake Erie, to head back to your starting point in the Huntington Reservation. The two Cleveland Metroparks Reservations that you'll ride through provide welcome places to stop for snacks or refreshments. The Rocky River Nature Center in the Rocky River Reservation has snacks, as well as park gifts, exhibits, and restrooms. During the warmer months, Mitchell's Ice Cream is open in the Huntington Reservation for refreshing post-ride treats. 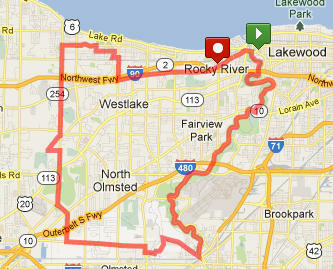 You can check out the full details of the West Side Metroparks Loop on Century Cycles' Garmin Connect profile and download the route to your own Garmin device. 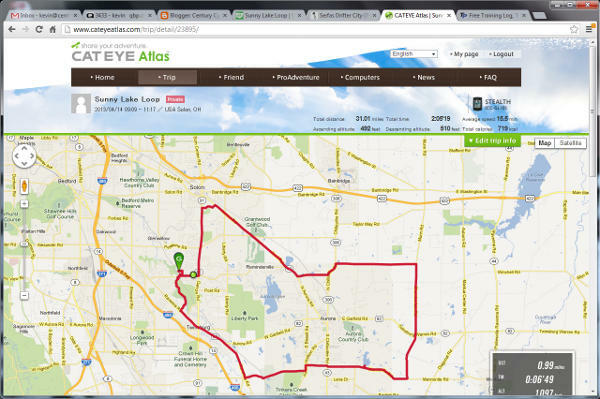 Non-Garmin users can see the route on MapMyRide.com. Have you been thinking about using a GPS-based computer to track your cycling routes, but have balked at the high cost of GPS devices? The new Cat Eye Stealth series of cyclocomputers give you GPS ride data in an affordable, easy-to-use package. I tried out the new Cat Eye Stealth 10 on a one of my favorite rides called the Sunny Lake Loop last weekend. Getting the computer set up was no hassle at all. It comes with a Quick Start instruction sheet, and you can download a more detailed instruction sheet (both in English only; no poring over 7 other languages to find the one you need) from Cat Eye's web site. To be honest, in both cases, the instruction sheets make it look more complicated than it really is. Just plug the included USB cradle into your PC or Mac to charge the unit. Turn it on, select your time zone and preference for miles or kilometers, and you're ready to go. No sensors or calibration needed! The Stealth 10 computer mounts using Cat Eye's FlexTight mounting bracket system. 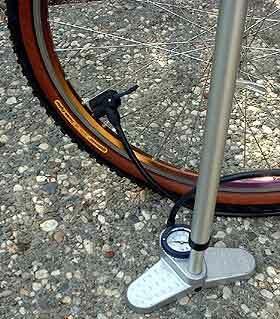 If you've got a current model Cat Eye wireless computer already, it's the same mount used by those, and if you need extra mounts for additional bikes, they are inexpensive and easy to install with no tools required. 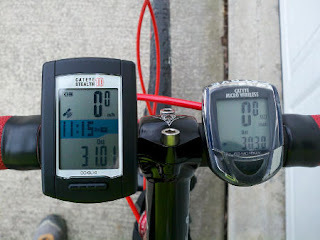 To test it out and compare the accuracy, I used the Stealth 10 on my Surly Cross-Check in conjunction with my old Cat Eye Micro Wireless computer, as well as the Strava tracking app on my smartphone. The Stealth 10 had no trouble keeping a connection to the GPS satellites, even on this cloudy day. While riding, it shows you the usual data like any cyclocomputer: current speed, ride distance, average speed, maximum speed, ride time, and time of day. The three-line display shows you your current speed and time of day at all times, and the bottom line scrolls through the other functions. The final mileage for the ride shown on the Stealth 10 was 31; my Cat Eye Micro Wireless showed 30.3, and Strava showed 30.5. That actually makes sense, as Strava usually seems to report a total distance about a half-mile less than the actual, and I have my Micro Wireless calibrated for a 700x32 tire, but the Serfas Drifter City 700x32 tires I'm using actually ride more like a 700x35. When you get home, just plug the Stealth 10 back into your computer to download the ride data. You'll need to install the Cat Eye Sync software (PC and Mac versions available). Then, you can upload the data to the web to view your route, track your mileage, and share your rides with friends. The Stealth computers work with Cat Eye's own Cat Eye Atlas web site. If your're already using a ride tracking web site, and don't want to sign up for an account on yet another site, you can also upload to your existing account on Strava or Training Peaks. The Cat Eye Stealth 10 is in stock at all three Century Cycles stores now. Coming soon, the Cat Eye Stealth 50 gives you all the features of the Stealth 10, plus compatibility with ANT+ sensors for speed, cadence, heart rate, and power; available from Cat Eye and third parties. Medina Bicycle Fair: Tuesday, April 30, from 6:30 to 8:00 p.m. at Claggett Middle School (420 East Union Street in Medina OH 44256). Bay Village Bicycle Fair: Wednesday, May 1 from 6:30 to 8:00 p.m. at Bay Middle School (27725 Wolf Road in Bay Village OH 44140). Rocky River Bicycle Fair: Thursday, May 2, from 6:30 to 8:00 p.m. at Rocky River Middle School (1631 Lakeview in Rocky River OH 44116). The bicycle fairs also help families prepare for Century Cycles’ Bike to School Challenge (www.centurycycles.com/for/BTS) on May 6-24, 2013, which is the largest and most successful student bicycling program in the United States, inspiring more than 4,000 middle school and high school students in Bay Village, Rocky River, and Medina to ride their bikes to school as much as possible for three weeks each May -- to help the environment, improve their health, win prizes and have fun. During last year’s Bike to School Challenge, Northeast Ohio students took 15,868 roundtrip bicycle rides to school. The numbers are staggering: In just three weeks, they biked 52,084 miles, prevented 57,292 pounds of carbon dioxide from being emitted, saved Mom and Dad $8,718.75 on gasoline expenditures, and burned a whopping 885,428 calories. · Professional bicycle mechanics from Century Cycles bicycle store will provide free bicycle safety inspections, display essential bicycle commuting accessories and information, and make smoothies on the Century Cycles blender bike. · Century Cycles and Raleigh Bicycles are teaming up to give away 20 bicycle helmets to the first 20 families who attend (limit: one helmet per family). · Bike to School Challenge organizers will be available to answer questions about the program. · Local police departments are providing free bike licenses. 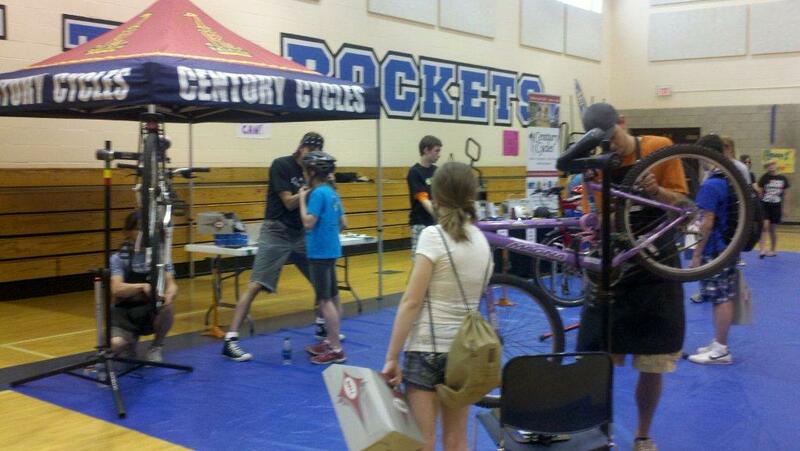 · Other information booths include Bike Cleveland, University Hospitals, and other BTS sponsors. Century Cycles teams up with the schools to organize and implement Bike to School Challenge each May, with the generous support of sponsors Raleigh Bicycles, Bike Cleveland, Subway, Honey Hut, Rize Pizzeria, Dairy Queen, Bay Lanes, People For Bikes, Bay Village Kiwanis, Bay Schools Parent Teacher Student Association, Rocky River PTAs, Project Earth Environmental Club, and the Bay Skate and Bike Park Foundation. For regular updates about Bay Bike to School Challenge, go to www.centurycycles.com/for/BTS, on Facebook at www.facebook.com/BikeToSchoolChallenge, and on Twitter at @BTSChallenge. The 30+ year process of building the Great Allegheny Passage (GAP) will finally be complete this spring! Riders will soon be able to ride off-road all the way between Point State Park in downtown Pittsburgh and Washington, DC. Several of our customers have completed this ride, as well as Rich, one of our mechanics in the Peninsula store, when he and a friend rode from Pittsburgh to DC this past September. 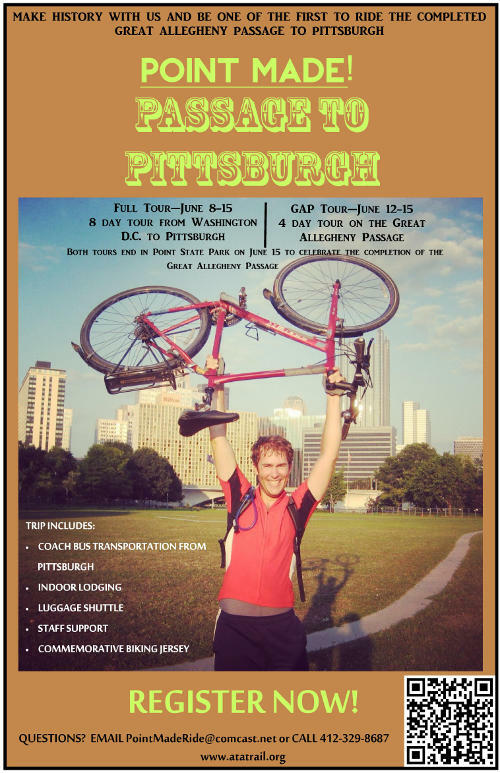 To celebrate this notable event, the Allegheny Trail Alliance would like to invite you to register for Passage to Pittsburgh, a ride starting in either Washington, D.C. or Cumberland, Maryland. 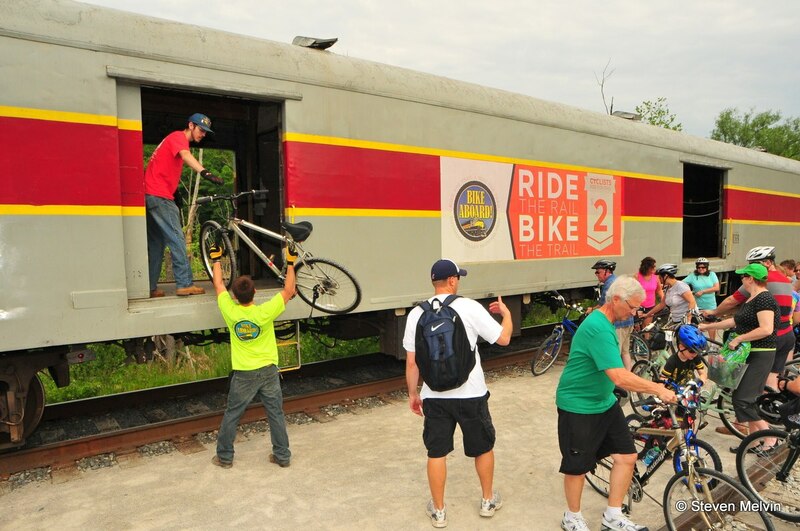 The rides will finish in Pittsburgh on June 15, just in time for Point Made!, a day full of events celebrating the completion of the trail, and will include a ribbon cutting, presentation, and unveiling of the marker at the Point. Visit www.atatrail.org/passage_to_pittsburgh_registration.cfm for more information and to register. Click here for a downloadable flyer to help spread the word! 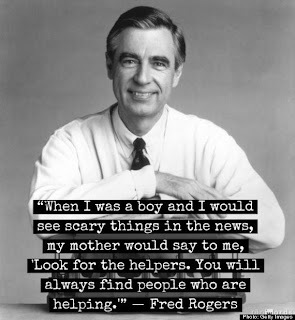 Scary and sad news from Boston today. Our thoughts and prayers are with everyone there, and we have deepest gratitude for the helpers. WOW! Century Cycles has been voted as the Best Bike Shop in Scene Magazine's annual Best of Cleveland poll! 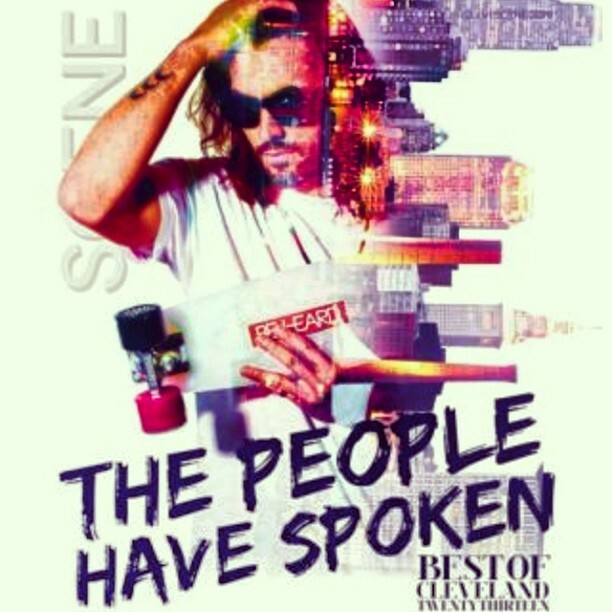 Huge thanks to everyone who cast over 35,000 votes during five weeks in a wide variety of categories. As Scene notes, "You selected the people, places, things and ideas that are pushing Cleveland forward...."
We're thrilled and humbled that the readers chose us. But really, they chose our amazing staff -- it's because of them that people have a great, vote-worthy experience at our stores (and later on their bikes) and that we are on this fantastic winning streak. Experience two-wheeled fun to help one very special home at the 4th annual Ronald McDonald House Night Ride on the Towpath Trail sponsored by Century Cycles on Saturday, June 1, at 8 p.m. -- Century Cycles only Night Ride for charity! 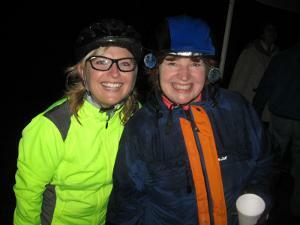 This is also Century Cycles' only Night Ride in Cuyahoga County! It's a 12-mile moonlit bicycle ride that starts at Thornburg Station in Valley View (8111 Rockside Road, at the intersection of Canal and Rockside roads, next to Yours Truly restaurant). The cost is $20 per person in advance until May 30 or $25 per person for night-of registration. All of the proceeds go to the Ronald McDonald House of Cleveland. To register (and for more information and riding tips), visit www.centurycycles.com/goto/RMH. At 7 p.m., attendees can check in, register for a pre-ride raffle, and Century Cycles mechanics will be conducting free pre-ride bicycle safety checks. At 8 p.m., the ride will depart south on the Towpath Trail, to enjoy the nocturnal sights and sounds of the area’s most popular bicycle path. Bicyclists will ride six miles, enjoy snacks and beverages at the ride’s turnaround point at the Station Road Bridge Trailhead, and then bicycle back to the ride’s starting point. After years of planning and fundraising, the Cleveland Velodrome opened in August of 2012. The Velodrome had a very good first season (albeit a short one) with total attendance of over 3,000 and nearly 250 riders having completed the Track 101 (Learn to Ride) program. The 2013 season opens May 1 and features more and better programming as well as a full race schedule. As such, below are some key dates to keep in mind for the next 30 to 60 days. Mark your calendars! April 13 – (11:00am to 2:00pm) – Velodrome and Grounds Maintenance Day. Staff and volunteers will do trash pickup, painting and general clean up. Ride afterwards if weather permits. April 17 – (12:40 to 2:00pm) - Tour of Velodrome and abbreviated Track 101, with 25 7th graders from University School. Email info@clevelandvelodrome.org to schedule your own group outing or event. April 19th (5:00 to 8:00pm) – 2013 Season Kick Off Happy Hour at Sokol Greater Cleveland. Learn about the track's plans and schedule for the 2013 season. Same basic format as previous Happy Hours except for more and fabulous door prizes, fixed gear roller racing, and discounted 2013 season passes. May 1 – Opening Day. Free hot dogs and beverages. More info to follow on Opening Day schedule and events. First Race of the 2013 season is Thursday May 23 from 6:30 to 8:00pm. See the Cleveland Velodrome web site for the complete race schedule and the event calendar. 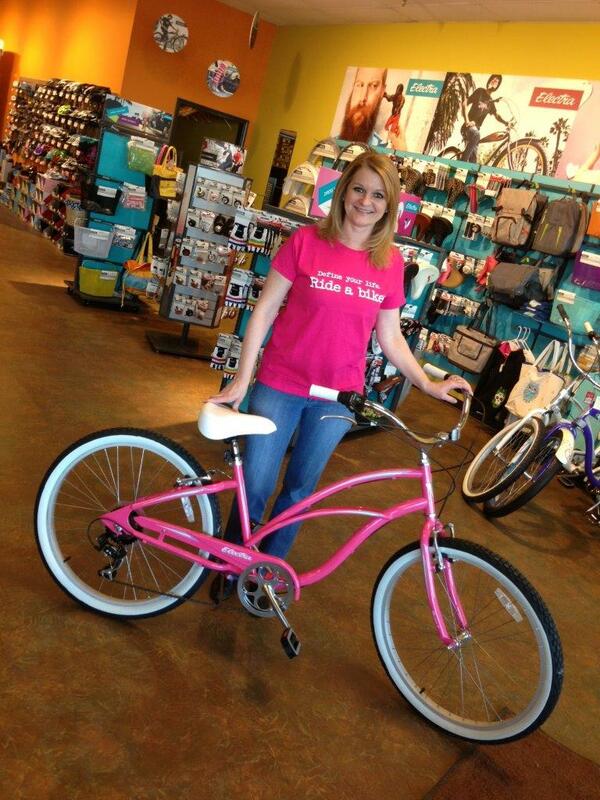 Congratulations to Trish Friery, winner of a $250 Century Cycles Gift Card in our recent contest on WKYC-TV 3! 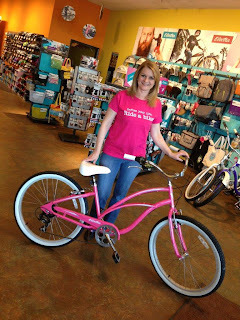 Trish used her gift card to buy a new pink Electra cruiser bicycle from our Medina store and, since every new bike buyer at Century Cycles gets their choice of free "Define your life. Ride a bike." swag, she now has a pink t-shirt to match her bike! Stay tuned -- we ran another contest on WKYC to give away a $100 Century Cycles Gift Card and will announce that winner in the next few days! 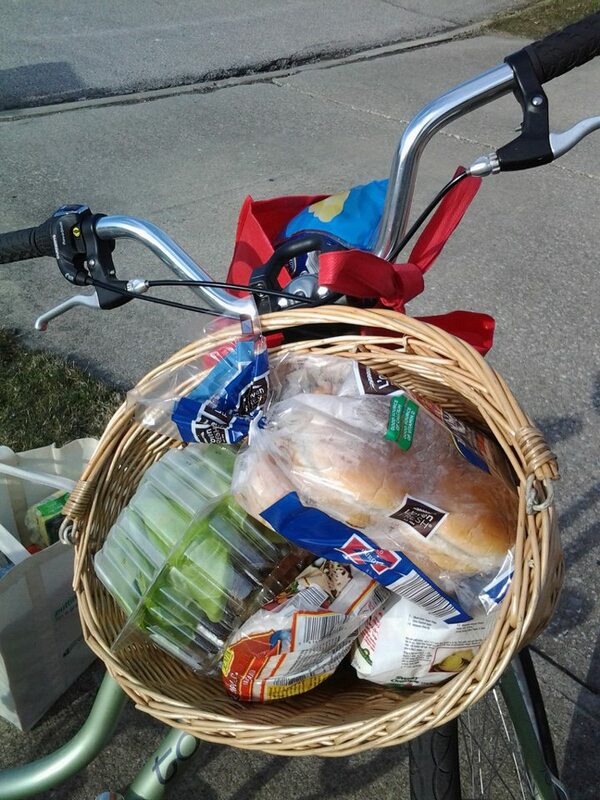 Finally, it's awesome to see people welcoming spring on their bikes, too. CC customer Shelley from Strongsville posted the picture below on Facebook and said, "Happy to be back grocery shopping on my bike today!" Amen, Shelley. Amen. 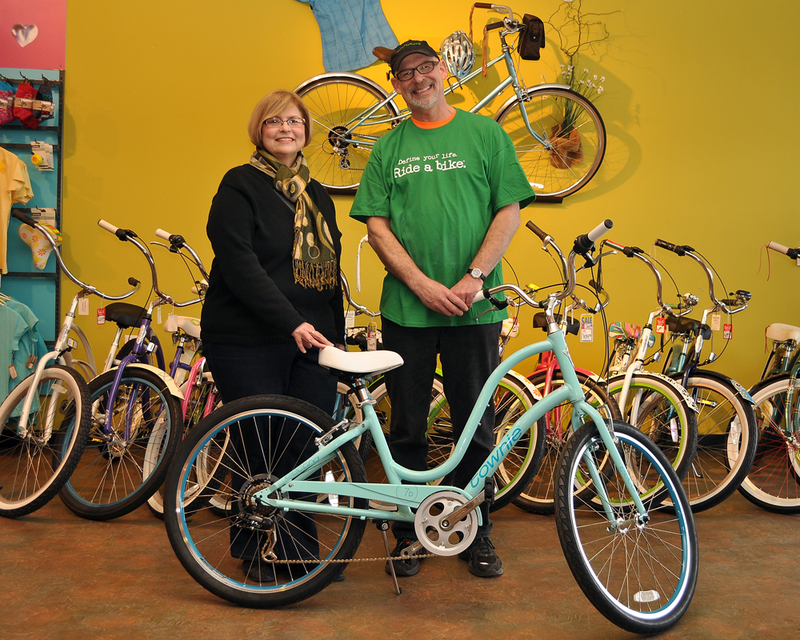 Cyndi McCabe is presented with her prize Electra bicycle by Mike Petcher, General Manager of Century Cycles. Congratulations to Cyndi McCabe of Elyria, the winner of Century Cycles' Electra Townie Bicycle Giveaway at the Great Big Home + Garden Show! 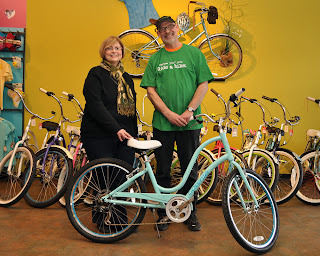 She won an Electra Townie 7D Bicycle valued at $459.99 from Century Cycles and Electra Bicycles. Cyndi said she's thrilled to win a great bike for around-town riding -- just what she has in mind for this summer. When presented with the vast assortment of Townie colors, Cyndi selected Polar Blue, then immediately set about accessorizing her new ride to Cyndi-ify it with a bell, basket, and much more! To see more comfortable and cool-looking Electra Townie bicycles for men and women, click here. Cyndi's name was randonly selected from the thousands of entries we received at our booth at the home show in February. When we notified her she won, we were shocked to learn Cyndi was already familiar with Century Cycles -- her husband, Chuck Sakryd, bought a Giant Defy road bike from our Medina store last year! Define your life. Ride a bike...in Everglades National Park! 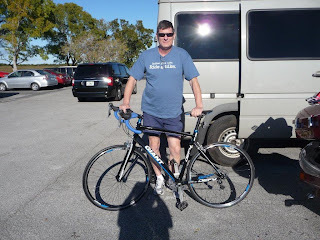 Chuck Sakryd takes his Giant Defy out for a ride in Florida. Bike Cleveland and the Northeast Ohio Areawide Coordinating Agengy (NOACA) need your help counting people on bikes May 7-10th. The data you help collect will be used to improve biking conditions in our community. In addition to knowing that you are helping make riding a bike an enjoyable experience for people of all abilities, volunteers will receive a gift card to a local bike shop of their choice...WHAT?!? That's right a free gift card to get some sweet bike gear just for helping count bikes. Of course, we hope you'll choose Century Cycles as your local bike shop, but that's up to you, SO SIGN UP NOW. For more information and to sign up, visit noaca.org or contact Marc Von Allmen at mvonallmen@mpo.noaca.org or 216-241-2414 ext. 250. This Sunday, April 7, join us for the first of our monthly Group Road Rides! We'll be starting at 10:00am from the Peninsula store. All skill levels are welcome! We'll be riding the Valley Loop, an 18-mile gently rolling route. The pace will be "medium" - not too slow, not too fast, and we'll wait at each turn for people to catch up. PLEASE NOTE: Until further notice, the Ohio & Erie Canal Towpath Trail is CLOSED to all foot and bicycle traffic. 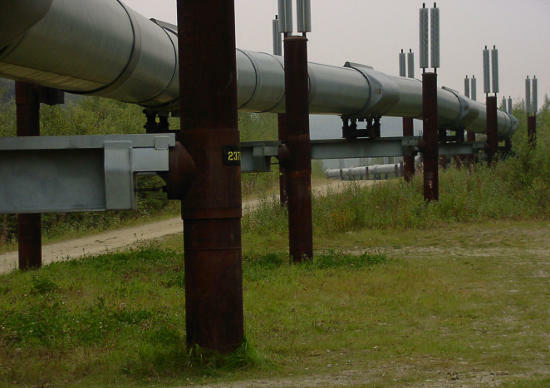 This is due to the construction of the new Buckeye XL oil pipeline. Ownership of the Towpath Trail corridor was transferred to BS Oil Company as a last-minute provision of a bill signed into law by President Obama on March 26, the "Consolidated and Continuing Appropriations Act, 2013."